107 problems by 42 authors from 15 countries took part in this fairy informal tournament. Moreover, the authors also came up with 10 versions, of which one was even a second version (456.2). The number of problems (107) was so high that it suggested a splitting of the award in at least two sections. There are many possibilities when splitting a fairy award, for instance: according to the number of units, according to the presence/absence of fairy pieces or of fairy conditions, according to the type of stipulations (help, helpself, direct, series) and so on. After some hesitations, I decided to split it according to the number of pieces (54 miniatures vs. 53 non-miniatures). In this judgment I tried to reward the density of fairy elements, the lack of formal defects as well as the originality of the ideas and the authors’ inventivity. The level was quite high and working on this award was a very satisfactory task. One author’s output was especially notable, both in originality and quantity. His problems represent 30% of the published problems and 40% of the miniatures. Therefore it should not come as a surprise if you often encounter his name in the award and his identity will transpire very soon. In problems 410 and 411 the stipulation Beidmatt was explained, as well as its difference with Gegenmatt and other stipulations – a commenter even provided a scan of Jörg Kuhlmann’s article in feenschach 1981. In 445 the definition of Take&Make Chess was clarified by its creator and the need for a new variant of this fairy condition was apparent. In 451 the exact definition of the Pressburger King, with all its implications, was also clarified in comments. 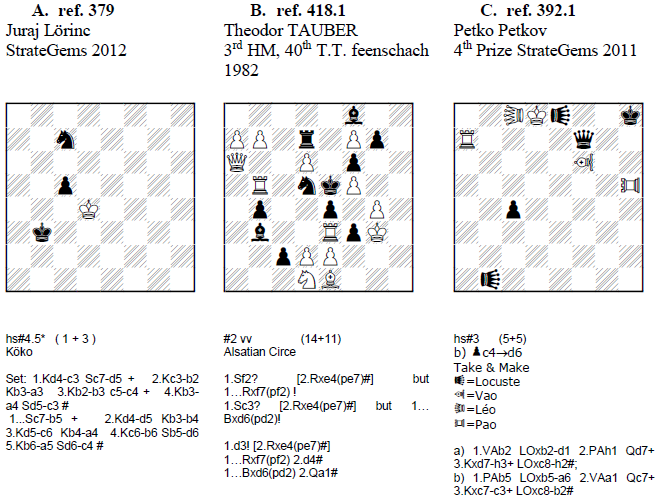 Finally in 457 the problem of the legality of the setting (King in a corner in GridChess) was raised and closed. A special case was problem 459. It did not receive any comment, because no one understood the solution. 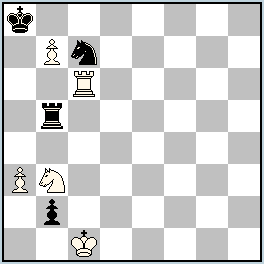 It would have deserved at least a question, because the white Poseidon is not mate after Black’s last move. Obviously the solution is the result of a bug in Popeye 4.63, which is regrettable. Later versions of the software no longer find this solution. I propose the following ranking for the miniature and non-miniature sections. 386 (Daniel Novomesky) presents 6 solutions but not actual echo mates, although there are some similarities between pairs of mates. 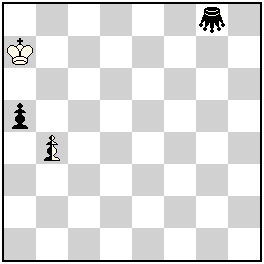 Perhaps the most interesting idea in the bunch was shown in the last solution, where the mate is given by the white King (the wK moves away from a field where it could serve as hurdle between a black Radial Leaper and the black King threatened by a white Radial Leaper). This idea would deserve to be extensively explored. 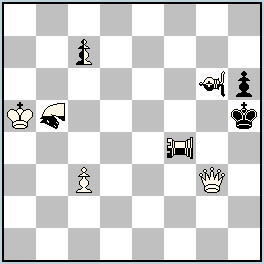 In 412 (Peter Harris), the promotions of the two white Pawns are changed, but the black Rook also changes its function, making the solutions less unitary. Field e8 is potentially guarded by wKe2 in first solution, in the eventuality of a capture of wRa8 by bKf8, while e8 is guarded directly by wBc6 in the second solution. 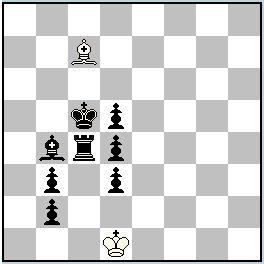 Too bad that the white King is not transmuted in the second solution. It remains an interesting and stimulating Tanagra. 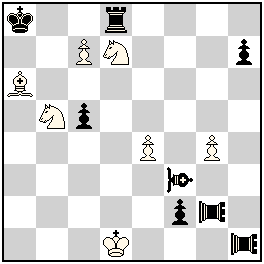 Try: 1.Ke5-d5[+wPe5]? 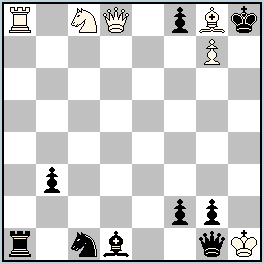 then 1.b7-b5 2.b5-b4 3.b4-b3 4.b3-b2 5.b2-b1=Q 6.Qb1-h7=S 7.Sh7-f8=B[+bPh7] 8.Bf8-a3=R 9.Ra3-h3=Q[+bPa3] 10.Qh3-c8=S[+bPh3] 11.Sc8-d6=B 12.Bd6-b8=R[+bPd6] 13.Rb8-b1=Q 14.Qb1-g6=S 15.Sg6-e7=B[+bPg6] 16.Be7-h4=R[+bPe7] & 1.e5-e6 Rh4-a4=Q[+bPh4] = too long. Peter Harris was the composer whose prodigious output I referred to in the introduction. In Julia’s Fairies he proposed two problems featuring the stipulation ##, i.e. Beidmatt. 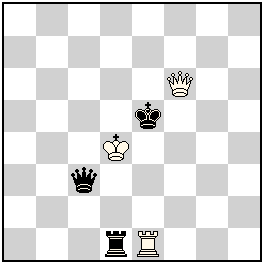 This one is more homogeneous than 410 strategically speaking: in each solution, both Kings end up in similar mate positions. Original and pleasant to solve. 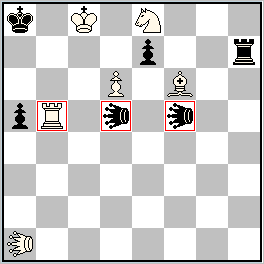 The try, with a stalemate that is distinct from the solution, fails because it is one move too long. Both lines of this Baby problem feature very specific play, which is to be expected with these fairy conditions. The problem would have been ranked higher if it had shown two equal length solutions. 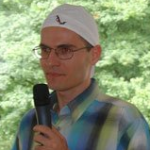 A Köko triple chameleon echo is a common production for Vaclav: he has composed more than 80 Köko chameleon echo problems, one of them even in Julia’s Fairies 2012 (problem 53 with Grasshoppers) and 7 of them were helpselfmates. This present production is dedicated to Juraj Lörinc because of Juraj’s 2012 problem (see Appendix A). However, it does not have the length or special characteristics of 380 (see 2nd Prize). The 100% Anti-Super-Circe specific solutions are finalized with echo mates. The solutions are rather symmetrical, which somewhat mars the general impression. 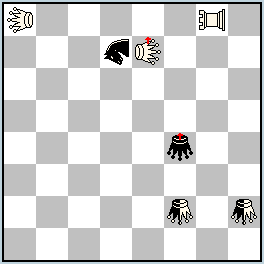 The sentinels combined with Patrol Chess allow original ‘pinning’ effects: a black unit cannot leave a square, because a wP would appear that would cause a check to the bK by patrolling. Uncommon both in conception and in twinning. Original combination of fairy pieces and conditions. 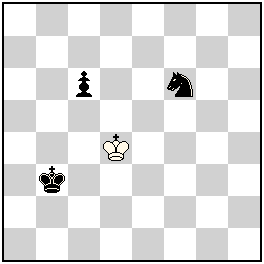 The original stalemate positions do not need to be in echo to be interesting. The uncommon and subtle twinning wKànK provides for completely different solutions. 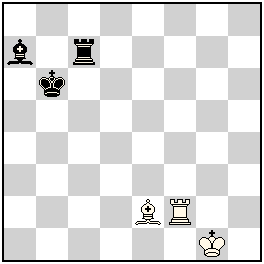 The wK prevents the solution from b) because 2.a5xb6 ep does not give check to the wK; the nK prevents the solution from a) because the longest move would not be 1…h1Q, but 1…nKb6/nKb8. Two chameleon echo mates produced at the end of a play with good fairy specificity and variety, as noticed by commentators: a splendid Tanagra. The Qs and Rs reciprocally exchange their functions in the Duplex solutions. This is definitely an original concept and an original use of the combination (Super-Circe+Isardam) Peter Harris is a specialist of. The number of SuperCirce effects in the solutions is unfortunately reduced, but it would have been a miracle to have more with this material. This pure product of the Bohemian school displays four chameleon echo mates. The play is unified play with two Super-Circe rebirths in the last two half-moves of each solutions. That the black King is in check in the diagram position does not disturb me. However, the nN is used as a nS in two solutions and this is slightly bothering. Incredible triple echo in three different corners. The long solutions and the far echoes make this problem a very peculiar instance of Köko echoes. The relative wealth of fairy units (6 types, belonging to 2 different families, the Chinese and the Grasshoppers) explains why approaching this problem is difficult. Once the solutions are understood and the strategic contents are assimilated, some commentators may wonder if this mix of different fairy units justifies the effort. Nevertheless, thanks to the seamless diagonal-orthogonal correspondence between solutions and the whole geometric beauty of the work, it earns its place in the award. As a preliminary remark, a note about 465 (S. K. Balasubramanian & K. Seetharaman). The good unity in the orthogonal-diagonal royal battery creation was somewhat spoilt by some defects that prevented its inclusion in the award: in b), W1 makes a capture; in a) Vao and Leo are doubled on the diagonal a3-f8 and a wP guards a flight of the bK to a5. Moreover, a presentation with bQh1 would have been more economical. 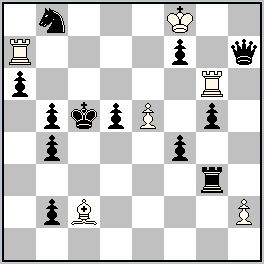 (White LEa8 VAd8 LEh8 Pb5 Pb4 Ka1 Bf1 – Black Pc7 Pd7 Pb6 Kb3 Pc2 Qh1 with same stipulation and twin). The author shows an original use of Alsatian Circe in direct mate thanks to a specific motivation of play. The fairy density is quite appropriate as far as Alsatian Circe is concerned: all variations (moving bPs toward the West of the board) are motivated by the need to enable the capture fxg6 and all white mates are made possible in turn by the rebirth of a white unit. Finally, as the author observed, the dual-avoidance in the first variation (1…exd3(Qd1) 2.Sf5+? exf5(Sb1)! because the capture is allowed by the Alsatian stipulation) is an integral part of the problem’s theme. At this point, I cannot refrain from quoting Theodor Tauber’s 1982 Alsacian Circe problem from 1982 (Appendix B): shouldn’t there be more such problems intermingling retro and fairy motives? Over the years Peter Harris has composed several problems with the combination of Einstein+Isardam. With Transmuted Kings it is an amazing mix of fairy conditions. 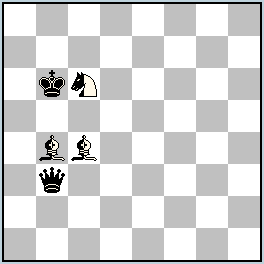 In the troubling initial position, the Kings are not in check because in Einstein a capturing pawn changes into a S and both Kings are guarded by S, making the capture illegal according to Isardam. Fairy conditions dictate move order and avoid duals (example in twin a) 1.Rc6-d6=B? makes impossible 1…Rb5-b4=B due to Isardam) and are all necessary to the solution and the final selfmates. The original feature of this problem is the following: the promoted unit is captured and moves to free the rebirth square and provide an anticipatory block of a line/square for the next reborn unit. As a further fairy specificity: in the mating position, the white reborn unit cannot capture the black PAO (respectively VAO) because it would be reborn on the 1st rank on g1 (resp. f1) and would serve as a hurdle for PAOh1. Unfortunately black play at B2/B3 is heterogeneous: the bR plays to selfblock in twin B, to interfere with bVAO in twin A. Another defect is that the scheme has static Chinese pieces – in fact only 4 units out of 15 happen to move during the two solutions. 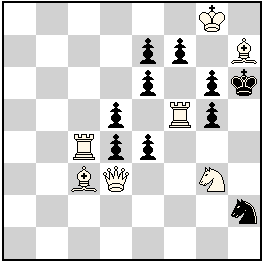 The first black move is a self-block and by clever construction also a square vacation. 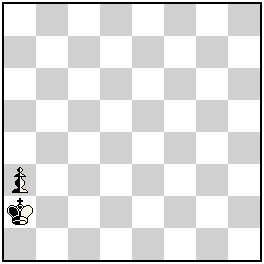 The blocked flight was initially guarded by a neutral unit and the same neutral unit will arrive on the vacated square on the last move, after a Rose battery play and the unpinning and capture of bRd3. The strategic complex would have been even more convincing if the created Rose battery had been set on different fields: the repetition of the capture of bPb5 on the 1st move is monotonous and the global fairy density is not too high. A marginally more economic version getting rid of wSf1 would be –wSf1, –bPh2, bPh3àg3, +nPd2 (1+7+6). a) 1.nNAb5-d6 nPc7-c8=nNA 2.nVAg6-d3 nNAd6-b2 = !! 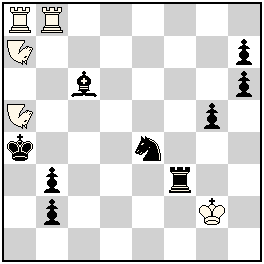 b) 1.nPAf4-a4 nPc7-c8=nPA 2.nVAg6-f5 nPAa4-a5 =!! c) 1.nVAg6-c2 nPc7-c8=nVA 2.nNAb5-f3 nVAc2-d1 =!! The three royal antibattery mates are built in the same, rather mechanical way. The author has ensured that the solutions contain plenty of unity, but concomitantly the white play brings variety and inventivity to the problem. In my opinion, this variety does not detract. However, wRg5 is underused. The presented cycle is undoubtedly original: cyclic double pins nPA/nVA (AB), nVA/nNA (BC), nNA/nPA (CA) combined with double half-moving Disparate-Py paralysis of both neutral pieces (nNAnNA, nPAnPA and nVAnVA) for Black. 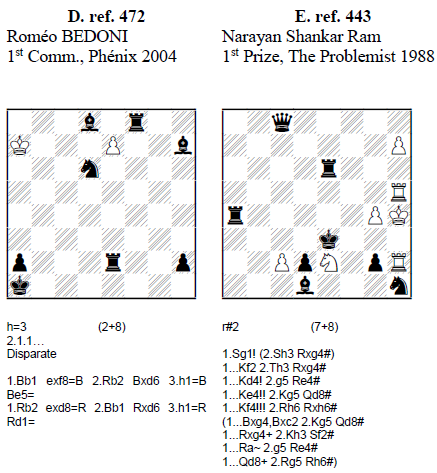 There are some similarities with Roméo Bédoni, 1st Commendation, Phénix 2004 (Appendix D): move order determined by promotion, pin stalemate and Disparate paralysis in the final position. But the author of 472 refined and developed the theme in 3D instead of 2D. There is a slight imbalance in twins due to the imperfect exchange of functions during the solutions: the neutral Vao plays twice at B2 (in twins A and B), when the neutral Pao should have played once. The problem would be better without this defect, but removing it is technically difficult. In that sense, the version proposed by G.Evseev was a good starting point, despite having other defects in the author’s opinion. 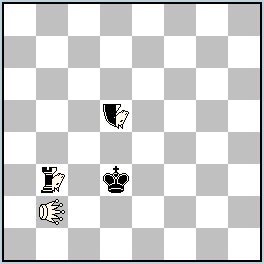 This Take&Make problem presents in a compact way some typical fairy effects, of which the obstruction-and-removing that would require more moves in orthodox chess. All moves require captures for various motives. It must be noted that the key has an AntiZielElement, because it gives the black King a flight by annihilating the piece guarding it. 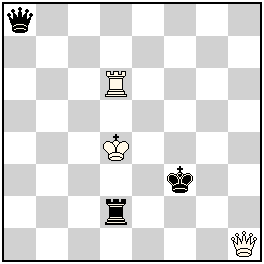 The black Queen’s ‘invisible captures’ as per WCCT-10 terminology (case where square A = square B) are especially striking. As Juraj Lörinc commented on Julia’s Fairies, the basic idea of parrying double check by very precisely determined Take&Make capture could also be found in Petko Petkov, 4th Prize StrateGems 2011, Appendix C.
But the author justifiedly underlined that the main mechanism is different. The reciprocal play by Pao/Vao enables the building of reciprocal batteries Pao/Vao for White and the bNs exchange their functions (Zilahi, but also all Black moves). All this is achieved in a dynamic and pleasant play with many active sacrifices. Dedicated to the memory of the victims of Riga tragedy! a) 1.b2-b1=wB!! Bb1xd3 2.Rc4-c1=wR!! 2… Bd3-b5=bB #!! b) 1.b2-b1=wR!! Rb1xb3 2.Bb4-a3=wB!! 2…Rb3-b6=bB #!! The Disparate condition, at least as it is implemented in Popeye, enables strange effects. For instance with Anti-Andernach, promotion is the only move that allows the same unit to move twice consecutively. And the unit that moves at the mating move is never the unit that gives the mating check, because it will be paralyzed at the next half-move. 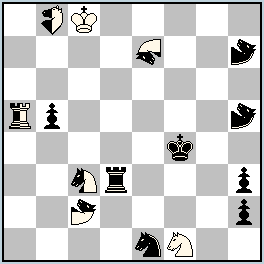 White must prepare beforehand the attack of the black King or, if Black collaborates nicely in Anti-Andernach, Black himself plays a paradoxical move that apparently puts his own King in check (by 2.Rc4-c1=wR and 2.Bb4-a3=wB). The author called this ‘creation of a Disparate battery’ and Julia named it a ‘deferred self-check’. The author also underlines the blocking of squares by the white pieces which change their color to black, and this effect is also specific of the combination Disparate + Anti-Andernach. On the whole, this work is a successful helpmate with high fairy density and originality. The self-obstruction by the black units (Nao and Pao), a difficult theme, is well done. The problem is also a welcome deviation from the usual diagonal-orthogonal correspondence. In the initial position, bRb5 and bPAc3 are pinned by the wNAd1: these technical units are hard to spare. 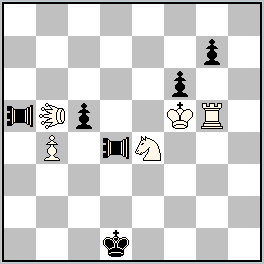 The problem also fulfils the WCCT9 Theme thanks to the critical moves of wNAf5, resp. wPAd3 and of bNAc4, resp. bPAf6. 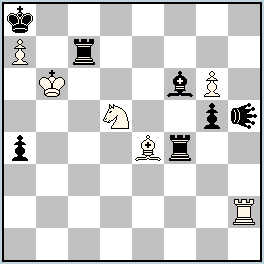 These moves by the thematic white pieces enable the capture of a black pawn, which will provide the single possible black move on B3. The version 460.1 eliminated a slight defect (the fact that wPA ‘tries’ were regrettably not echoed in the wNA variation) and another more serious defect (wSc7 was useless in one solution). The opening of the diagonal of wVAe5 by bPAd6 is not replicated by bNAc4 and Petko Petkov proposed a version to remedy that inconvenience. However, that feature is completely secondary to the strategic complex and whether the Bulgarian version or the Russian version is to be preferred is a matter of taste. Dedicated to Julia Vysotska at her birthday 16.09.2013! These difficult solutions with anti-batteries K-Pao and N-Pao present 2 exchanges of functions Gd6/Ge6 and Ne7/Nh6 and two sacrifices by bNs in each solution. The uniqueness of the solutions is guaranteed by the need to guard by the wN the square vacated by the wG. Construction is excellent and the solutions, as intended by the author, are difficult. A Locust is taboo in Take&Make and cannot be captured, as the normal move of a Locust is a capture move and the ‘Make’ move can’t be a capture move. This aspect is not shown for the first time in Take&Make problems (see for instance the previous Petko Petkov, 4th Prize StrateGems 2011, Appendix C). Here, the Locust inflicts orthogonal and diagonal mates and collaborates smoothly with the remaining black unit. With relatively few pieces on the board, the high fairy density is remarkable. Twinnings using the differences between Anti-Circe Cheylan and AntiCirce Calvet are usually a complex matter. A renowned specialist of this type of twinning is Klaus Wenda. Therefore some explanations may be useful for the reader in order to understand this complex problem. 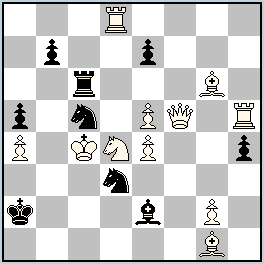 The solution of a) fails in b) because Black could play 4.Ra1xa8 [+wRa1][bRa8->a8]. 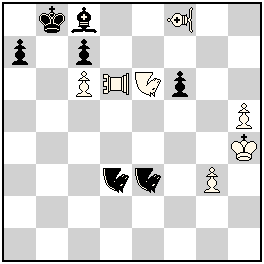 The solution of b) is illegal in a) because Black is not allowed to play 1…Ra8xa1 [+bRa8][wRa1->a1] in Anti-Circe Cheylan. 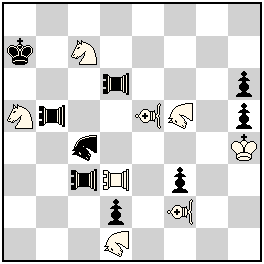 In the final position of twin a) the black pieces on a1-c1-d1-g1 are specifically pinned by the hypothetical promotion of wPg7 by capture of bKh8, which would be followed by the rebirth of the promoted pawn on a1 in case of Rook promotion, c1 for Bishop promotion, d1 for Queen promotion and g1 for Knight promotion. 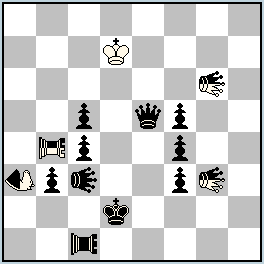 Besides, the capture of wPg7 by the bK or bQ are forbidden due to the occupation of their rebirth squares d8 and e8. In the solution of b) a sarcophagus is built in the NW corner for the bRa8 and it is locked by bSa6. 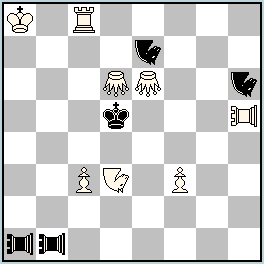 The fact that a different black Pawn blocks e8 in each solution is the cherry on the cake. The excellent twinning (Anti-Circe Cheylan/Calvet) enables completely different solutions showing the rich possibilities of the rebirth on capture square. The second solution is especially spectacular with its 100% specific moves and 4 Super-Circe rebirths. The slight unbalance between solutions made me grant this problem a special award. In Duplex the thematic exchanges are not limited to one color. Here the pairs of units reciprocally exchanging their functions are bPAOd2/wVAOf4, bVAOc1/wPAOh3 and bSb4/wSe6. The orthogonal-diagonal change between the two solutions is an impressively pure geometrical achievement spiced up with varied pins and unpins. The visual impression is somewhat marred by the piles of black Pawns and white Pawns but adding all these blocks could hardly be avoided. The originality of the conception raises this problem to this high reward. Dedicated to Petko A. Petkov! No.370 Michal Dragoun & Ladislav Salai jr. Amateurs of battery play will be delighted by this problem. The white and black half-batteries both play and thus the two front pieces of each half-battery exchange their functions. The initial black half-battery transforms into two new black batteries created on different lines. 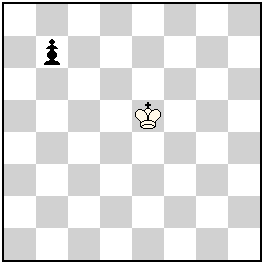 In the same time, the active white King enables mates on different fields and lines. 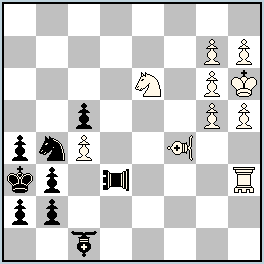 This strategic complex loaded with battery play was a worthy dedication to GM Petko Petkov! Readers interested in antibatteries in AntiCirce h#2 with orthodox pieces can have a look at the award of the 3rd round of the 2007 Liga Problemista, published in MatPlus 27. Here the authors offer specific AntiCirce battery motivation for fairy units: the rebirth square is common for two fairy units that give check after the wK captures the fairy piece that occupied the rebirth square. What results is a cyclic exchange of function between 3 neutral units as well as a cyclic Zilahi and an impressive aesthetic achievement. 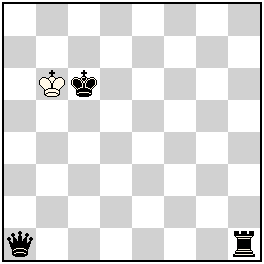 Now have a look at the complicated and eventful solutions that can be replayed here: 6 moves out of 8 are captures and pieces fly all over the place, especially both active Kings, in a weird ballet involving 4 pairs of units that reciprocally exchange their functions. During the solution, an indirect white royal battery and a direct black battery are created and many lines are opened and used for the complex strategy. This problem dwarfs previous achievements in Take&Make helpmates or helpselfmates and reminds of Vlaicu’s 1st Prize in the FIDE Olympic Tourney, 2012 (hs#3 Take&Make). A real blockbuster, as it was called by Shankar Ram, but not devoid of subtlety. Shankar Ram has tamed the Moose to show us a black correction of the 4th degree and the best problem of the tourney. The great key offers two additional flights and exposes the white King to four different battery checks by Pickaninny moves. All this is achieved in Meredith form for the first time – although, truth be said, quaternary black correction has already been achieved in Meredith and without orthodox units, and black correction of a lesser degree has been achieved many times in combination with Pickaninny. The author himself composed a very nice reflex twomover with quaternary black correction – see appendix E for the pleasure of it). 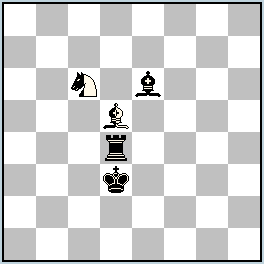 The author managed the trick by the astute disposition of the paralyzing units (black Moose and white Rook) and of the dual-avoiding white Moose. My congratulations to the awarded composers and my thanks to Julia, who asked me to act as a judge and who kindly put up with the delay in this judgment. Nicely analysed award by Eric Huber. Very happy to see Shankar Ram in the prize list again, that too with a well deserved first prize. Congrats to all the other winners too!